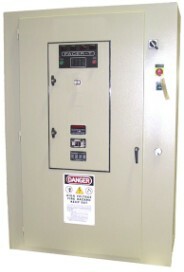 The Pacer is the first solid state induction power supply to use fiber optics to eliminate noise generated faults. Fiber optics eliminate the need for filters to isolate noise to the logic board. With this micro controlled state of the art technology, isolated from any water or electrical failure in the power circuit, board life is dramatically increased and maintenance greatly reduced. The self diagnostics of the logic control and pulse amplifier boards with a front annunciation panel aids in trouble shooting. Optional water path temperature monitoring is available. All nonferrous components with self contained pump and motor, and high efficiency heat exchanger insures high quality water is fed to the critical components.